Here’s another book I came across while cataloging and just had to put on hold: Sad Animal Facts by Brooke Barker. Flatiron Books’ promo line reads “A delightful and quirky compendium of the Animal Kingdom’s more unfortunate truths, with over 150 hand-drawn illustrations,”–and that’s exactly what it is. Delightful illustrations with quirky facts about each animal. Each fact is accompanied by a quip from the anthropomorphic cuties. And the appendix includes more facts with explanations, so you can find out things like why dik diks mark their territory with their tears. 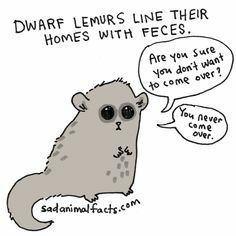 Library lovers will enjoy the fact that Brooke Barker spent time as a reference librarian, and started illustrating these sad animal facts in her downtime on the desk.